Redlands, California—Global smart mapping leader Esri today announced that 10 additional speakers have joined the eighth annual Geodesign Summit, to be held January 24–26, 2017, in Redlands, California. The Geodesign Summit is a forum that brings together planning and design principles from academia, commercial design firms, nonprofit organizations, and government. 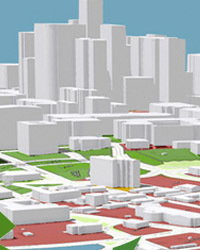 Geodesign answers the need for a more efficient, sustainable, and holistic approach to planning. Summit attendees benefit from collaboration and sharing best practices with their peers, understanding new trends and technology that will affect the planning community, and connecting with Esri partners that offer dedicated solutions to business problems. Summit speakers will explore trends in building and planning through geodesign while demonstrating how geography plays an integral role in designing communities; planning for regional collaboration; and building more resilient, sustainable, and green infrastructure. This year's event will focus on smart planning technology and geodesign techniques to engage and communicate effectively across departments and with the public. The speakers will share firsthand accounts of how various organizations are putting geodesign into practice to develop smart communities today. "The Geodesign Summit will be an exciting opportunity to witness how geodesign and other innovative techniques and technologies are bringing energy and new ideas to planning and related discipline," said Drinan. The two-day conference is valid toward The American Institute of Certified Planners (AICP) accreditation. Early bird registration closes November 30, 2016. For more information, please visit go.esri.com/pr-geodesign-summit.